Jarawa musicians/dancers, originally uploaded by nobodaddy69. The Middle-Belt is a patchwork of ethnic groups, cultures and languages, many of which are not known outside the area to other Nigerians. One such group are the Jarawa. 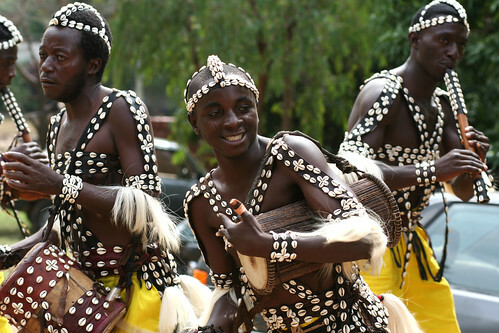 I had the privilege to see some Jarawa guys perform some songs and dances while in Jos. The way they circled and twirled round each other reminded me of English country dancing. The music was a hypnotic mix of bass drum, talking drum and high pitched flutes. It was compelling to watch..
the middle belt as u rightly mentioned remains this obscure vast 'lala-land' to most of us from the South; thanks for sharing; one day Nigeria will be one. Before the last Commonwealth games which were staged in Melbourne, Australia. As the torch was making it's way round the Commonwealth, when it came to Nigeria it was confined to the environs around Abuja. They had one boy, who was identified as Jarawa who was holding the flame. I remember it because he had a distinctive face and was looking very stern. That's how I came to hear of the Jarawa. Mr. Jeremy you know much about Nigeria than most of us do by far. I have never heard of Jarawa before even though i lived in the middle belt. For most Nigerians, if it doesn't have anything to do with Lagos or Abuja or Yoruba, Hausa/Fulani or Igbo we don't know and we don't wanna know. Heck, we are not even adventorous at all. For instance, how many Nigerians have ever travelled outside there immediate environs? Or how many would even consider a road trip around there country? Almost none. I just learnt of the Jarawa who live on the Andaman Islands.